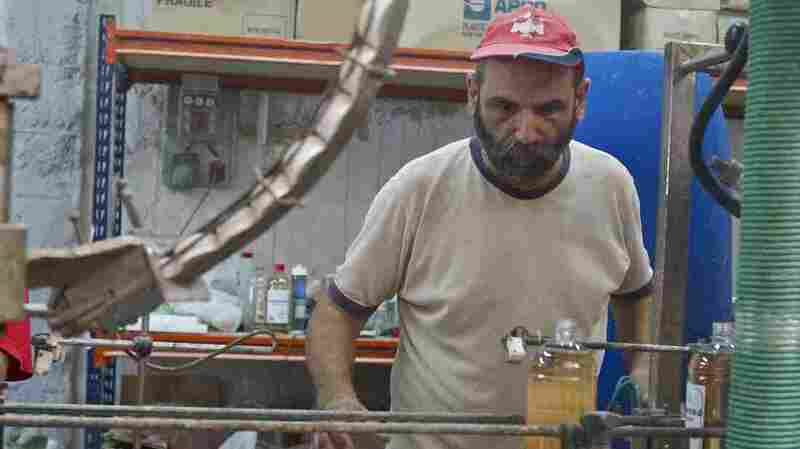 Citing Dignity, Greek Workers Take Over Factory : Parallels The factory in northern Greece once produced glue for ceramic tiles. But when the country's economy collapsed and workers lost their jobs, they took it over to make environmentally friendly laundry products. Workers do everything from accounting to driving. Their effort is a hit with left-wing groups, but it's not showing up in workers' paychecks. 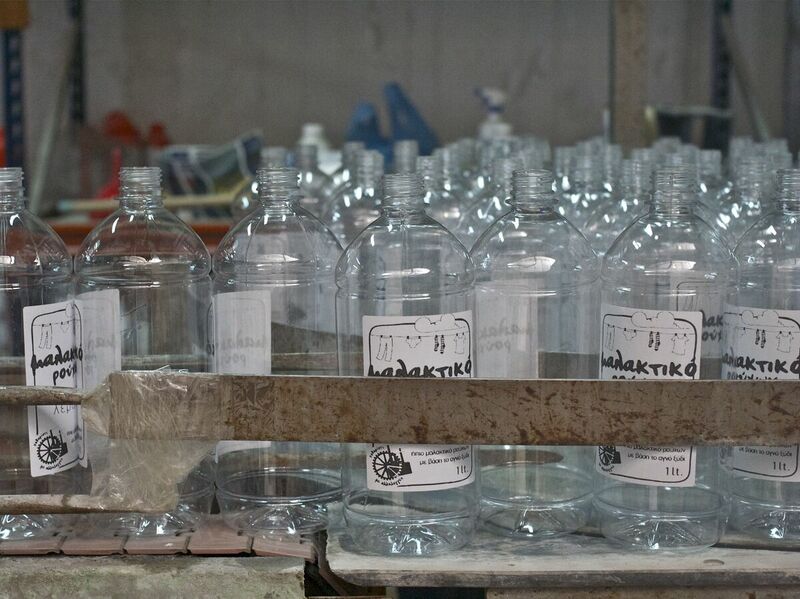 Makis Anagnostou, a worker and union leader, bottles lavender-scented fabric softener at VIO.ME, a former tile materials factory that went bust and has been revived by its staff as a collective making environmentally-friendly detergent. The financial crisis in Greece has devastated the country's manufacturing sector, which has lost more than 30 percent of its jobs in the past three years. But at one factory in an industrial center in the north, workers have taken matters into their own hands. Inside the cavernous factory on the outskirts of Thessaloniki, eight middle-aged men are filling bottles with a vinegar-based fabric softener that's scented with fresh lavender. This assembly line used to produce glue for ceramic tiles. But the collapse of the construction industry killed demand for building materials. Dimitris Mokas, one of the men working here, says Greeks still need to wash their clothes — and his firm's new line of laundry products are a good deal. "You don't want to go to the supermarket and [buy] soap for clothes and pay 20 euros when we will give you for 3 euros," he says. This firm is called VIO.ME. It's short for Viomichaniki Metalleftiki, or Industrial Mineral. VIO.ME is a subsidiary of Philkeram Johnson, a Greek company that once made ceramic tiles and exported them to 29 countries. Philkeram Johnson declared bankruptcy in 2011. VIO.ME's 70 employees stopped getting paychecks the same year. But they still came to work and continued making glue and tile-cleaning products. For a time, they also received unemployment checks, Mokas says. "Unemployment benefits finished last September," he says. "We said, 'what can we do now? Stay only here and be guards here? We have to eat, we have to do something.' Because we want to have work." Finding a job in Greece is daunting. More than 27 percent of Greeks are out of work; northern Greece is especially hard-hit. That's why half of the VIO.ME staff decided to occupy the bankrupt factory and revamp it to turn out environmentally friendly detergent and fabric softener. The workers start their shifts at 7 a.m., and they do everything, Mokas says. "I was driving a forklift and now I'm an accountant ... a supplier, driver, anything you want," he says. That includes being a manager. There's no boss here, so for the past five months, Mokas and his fellow workers have also shared the administration of the plant. The court has appointed a liquidation lawyer, Giorgos Vanaroudis, to administrate the bankruptcy of VIO.ME's parent company, Philkeram Johnson. Empty bottles that will hold fabric softener made with vinegar and lavender. Vanaroudis told NPR that the workers of VIO.ME — like other potential buyers — don't want to pay for shares in a company that's more than 4 million euros ($5.3 million) in debt. He says a court in Thessaloniki is now considering whether to appoint administrators for VIO.ME who will allow the workers to remain on the property — or kick them out. The VIO.ME workers have been inspired by a precedent in southern Argentina, where the laid-off staff of Zanon, a ceramics factory that closed in 2001, took over the plant and now operate and own it. The Argentine workers also renamed the plant Fabrica Sin Patrones — Factory Without Bosses — and it's a darling of leftist organizations and labor activists. The same kinds of activists also support VIO.ME, which also collects donations through PayPal on the plant's website. What they're not getting is credit from any undercapitalized Greek banks, which rarely give out loans anymore, says Athanassios Savakis, president of the Federation of Industries of Northern Greece. "The problem is liquidity, in fact," he says. "The extrovert companies, the ones with high levels of exports, have faced this in a positive way." Those companies make money selling their products abroad, whereas the factory workers are struck selling their detergent in a depressed local market. VIO.ME's fabric softener may not have a future. But the workers still put in eight-hour shifts on the assembly line every day. When the shift is over at 3 p.m., they line up in a hot, airless office for a day's salary – just 10 euros, or about $13. Dimitris Nikolaidis, a tall electrician with a crown of salt-and-pepper curls, walks to his aging sea-blue Daewoo Lanos. "It's really difficult to live on this salary," Nikolaidis says, as he drives home. "The truth is, you can't live on it. It's just enough money to pay for me to get here and keep working." In the back seat is Giorgos Deligiannis, a bespectacled machine operator in a pressed pastel shirt. He says it's been hard to learn so many new skills, including accounting, and to manage so many different personalities in a collective that insists on equality over ambition. "But we're trying to be patient," he says. "We want to believe that things will improve." Outside their factory, the economy is broken. Inside these walls, the men are surviving. And they say they have found dignity, if not money, in their work.